in the side aprons (D) centered over the dadoes cut in the previous step. Chuck a 5/32" bit into your drill press, and drill holes centered inside the counterbores. 5Chuck a 'A" round-over bit into your table-mounted router, and clamp a fence flush with the bit's bearing. Mark start- and stop-lines on the fence for the round-overs . (stopped l'A" from each end, as shown on Drawing 1) on the side and end aprons. Rout the round-overs. 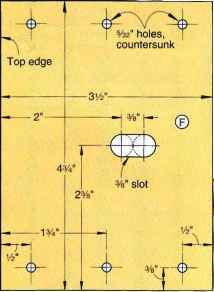 6 Mark the centeipoints of the holes on the corner braces (F), and then drill and countersink them, where shown on Drawing 7. Use a chisel to finish forming the slot after drilling out most of the waste. 7 Prepare a large flat surface (we used a half-sheet of plywood), and then lay out the parts for assembly. (You will find it easier to assemble the table upside down.) Brush glue into the V-dadoes, and then loosely assemble the leg assemblies, aprons, and corner braces. When everything is aligned, tighten the nuts on the hanger bolts. Next, using the holes in the corner braces as guides, drill Vm" pilot holes V2" deep into the apron sides and ends. Then, drive the screws through the corner braces. 8Cut the center brace (G) to length, checking it against the base assembly. Glue and clamp it in position. Then, using the holes in the side aprons as guides, drill %»" pilot holes 1" deep into the ends of the center brace. Drive the screws, and then glue the mahogany plugs into place. After the glue dries, sand the plugs flush. IRip and crosscut the top panel (H) to the dimensions listed in the Materials List. Rip l"-wide strips of banding (I, J) from W-thick stock. Miter-cut the ends of the parts, and then glue and clamp them to the perimeter of the top panel flush with its top surface. 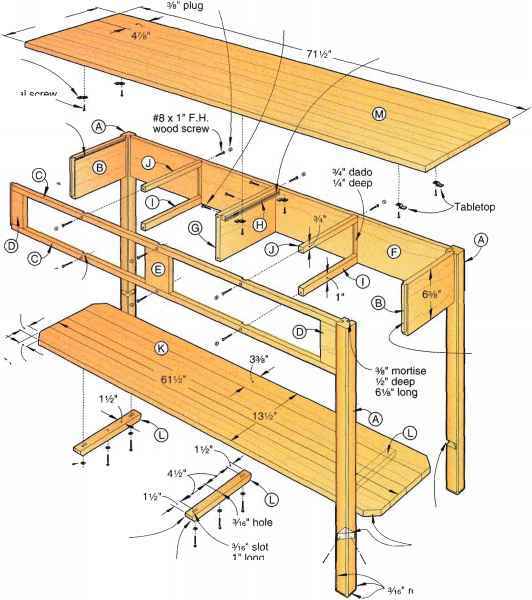 2 Put the top assembly facedown on your workbench, and center the upside-down base on it. Trace the outline of the aprons and center brace on the plywood to indicate where to drill holes for the screws that attach the top to the base. Remove the base, and mark the screw-hole centerpoints. Drill a V32" shank hole at each centerpoint. Turn the top assembly over, and countersink the holes. 3 Place the top on the base in its final position, and then clamp the assemblies together. Using the holes in the top panel as guides, drill Vm" pilot holes 3A" deep into the aprons and center brace. Drive the screws, making certain that each head is slightly countersunk. 4 Fill the holes in the top panel with putty. Let it dry, and sand it flush. ICut plastic laminate for the top surface (K) initially oversized to 34x46". 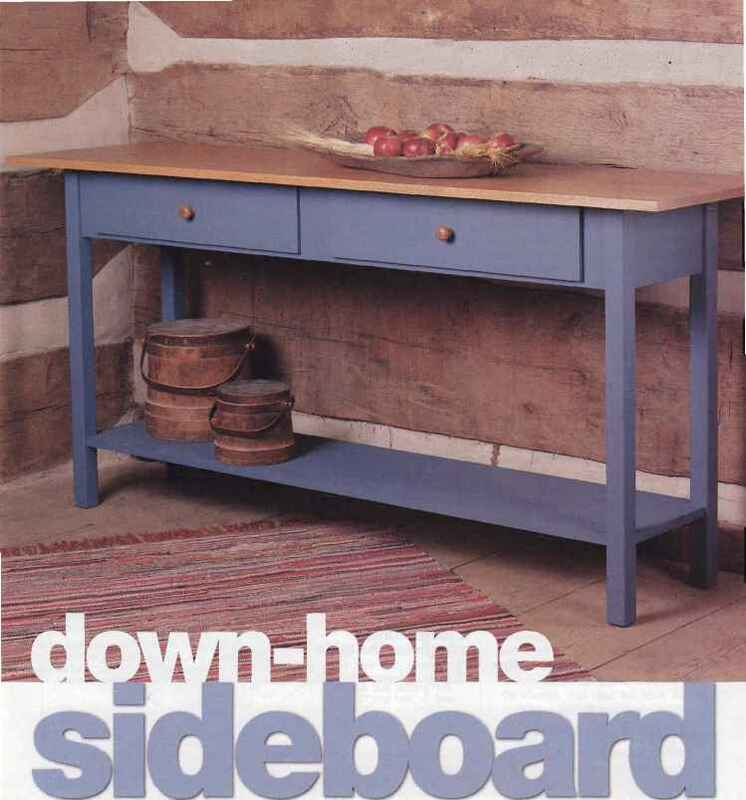 (We used Formica color 942, Nile, matte finish.) 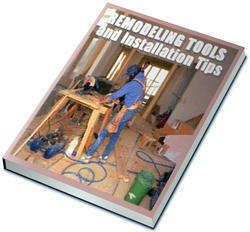 Apply contact cement to the laminate and the top assembly according to directions on the can. 2 When the contact cement is ready to bond the parts, place clean spacers (we used seven '/^''-diameter dowels) on the top assembly, and then center the laminate on the spacers. Trim the laminate and shape the edge banding at the same time. Rout counterclockwise around the top. "Parts initially cut oversize. See the instructions. Materials key: M-maple, LM-laminated maple, MH-mahogany, P-plywood, PL-plastic laminate. Supplies: Vs" tempered hardboard for splines, y8x3V2" hanger bolts (4), ¥b" flat washers (4), %" hexnuts (4), #8x1 VV1 flathead wood screws (24), #8x1 'A" flathead wood screws (21), contact cement, wood putty, clear finish. This country-style treasure can adorn a hallway or foyer as a side table, or it can be used in a dining room as a sideboard. Use the top and lower shelf for displaying collectibles, and fill the roomy drawers with utensils or odds and ends that need a home. Dadoes and screw holes In the back rail are In the same location as those in the front rail. 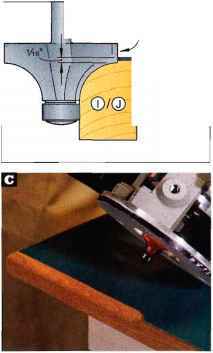 Secure a 45° V-block to your miter gauge to cut the W notch in each leg. 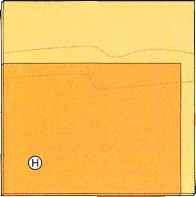 IFrom laminated stock or 8/4 material (commonly called eight-quarter stock), cut four l%"-square legs (A) to 32'A" long. Mark the mortise locations on adjacent surfaces, where dimensioned on Drawing 1. 2 Fit your table-mounted router with a 3/s" straight bit set to cut Vi" deep. 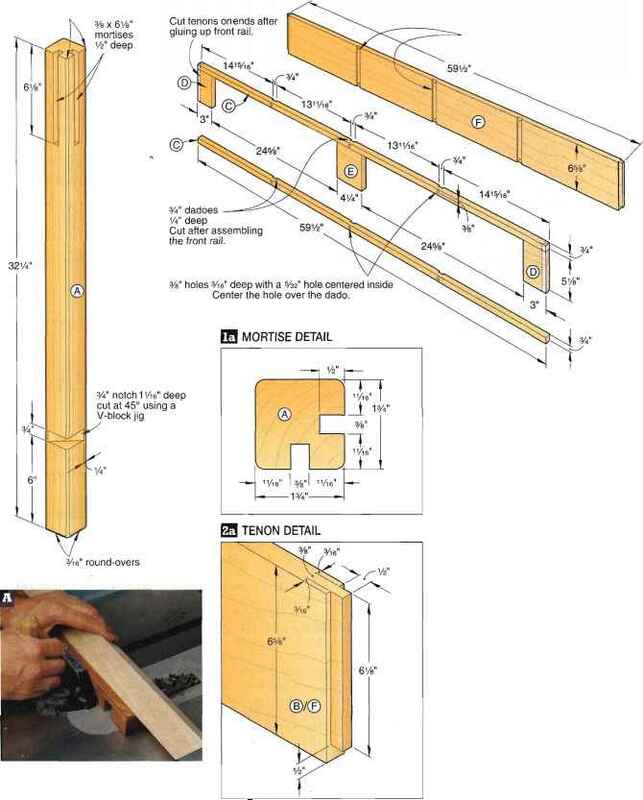 Position the router-table fence to cut a mortise centered along the edges of the legs, where marked on Drawing 1a. Clamp a stop to the fence to ensure all eight mortises are exactly 6W long. 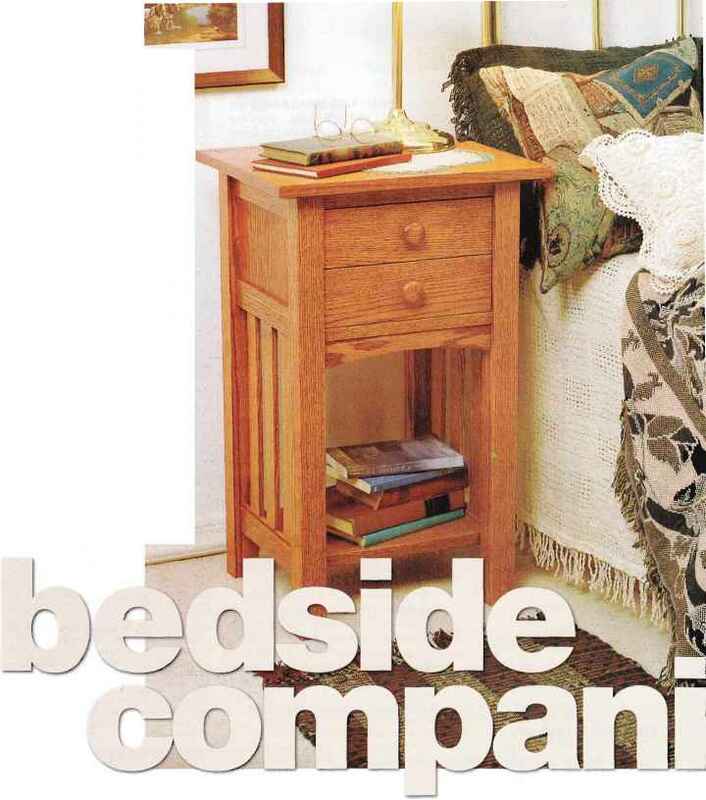 Rout the mortises, then chisel the round-routed ends square. 3Mount a 45° V-block support to your miter gauge, as shown in Photo A, far left. Fit your tablesaw with a 3A" dado blade. Cut a %" dado 1 'Ae" deep and 6" from the bottom end of each leg, as shown in the photo and dimensioned on Drawing 1. End cleats are mounted 8" from ends of shelf. Trim corner of shelf at 45° to match notch in legs.